Got Buzz @ Kurman Communications: Thanksgiving Menu at Deerfields Gluten-Free! Stuffing cubes, mini baguettes, artisan rolls, and pies will make your Thanksgiving Day a breeze and everyone can enjoy! We have pecan pie, Dutch apple streusel and pumpkin pie. Please order by Thursday, November 20th by calling 847.520.0068 x 2. Our pecan pie is made without corn syrup. Our apple pie is loaded with apples and topped with a streusel made with certified gluten-free oats. Our pumpkin pie is nicely spiced and not too sweet. Our pie tasters (with wheat-eating taste buds) gave these pies two thumbs up. They especially loved the pie crust. 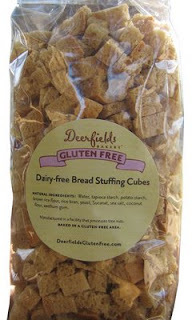 Most stuffing cubes are 14 oz; ours are 1-lb and make enough stuffing to feed 8-10 people at least! Pecan Pie: Pecans, organic evaporated cane juice, brown sugar, butter, eggs, water, vanilla. Apple Pie: Apples, streusel (brown sugar, butter, certified gluten-free oats, brown rice flour, coconut flour, cinnamon) sugar, tapioca starch, butter, lemon puree. Pumpkin Pie: Pumpkin puree, brown sugar, maple syrup, heavy cream, eggs, water, cinnamon, ginger, cloves, allspice, salt, brown rice flour, tapioca starch. Pie Crust: Butter, cream cheese, brown rice flour, potato starch, coconut flour, rice flour, quinoa, xanthum gum, salt. Non-dairy Rolls, Baguettes, Stuffing Cubes: Water, tapioca starch potato starch, brown rice flour, rice bran, yeast, Sucanat, sea salt, coconut flour, xanthum gum. Order by Thursday, November 20th. In order for us to plan ahead, all pies and stuffing cubes are special order only. And while you are at it, please order your rolls and/or mini baguettes, so that we don't run out. Deerfield Store: Tuesday, Nov 25 AFTER 12:00 p.m. only (no morning pick-ups) and Wednesday, Nov 26, 6 a.m. - 5:30 p.m.
Buffalo Grove Store: Tuesday, Nov 25, 6 a.m. - 5:30 p.m. and Wednesday, Nov 26, 6 a.m. - 5:30 p.m.
Schaumburg Store: Tuesday, Nov 25, 6 a.m. - 5:30 p.m. and Wednesday, Nov 26, 6 a.m. - 5:30 p.m.
Deerfields Bakery is closed Thanksgiving Day. The gluten-free department will be closed Thursday, November 27 through Sunday, November 30. Any special orders for Friday, November 28th MUST be placed by Tuesday, November 25 by . We will NOT be accepting any special orders for pick-up on Saturday, November 29 or Sunday, November 30 or Monday, December 1.